BULAWAYO, Zimbabwe, Jan 20 2016 (IPS) - Small-scale farmer Augustine Sibanda has grown resilient traditional sorghum varieties passed down through generations but has increased his yields after he adopted improved seed varieties developed through research. Sibanda, a farmer in the Jambezi District in semi-arid Matabeleland north province, is passionate about farming and is astute in seeking and applying new knowledge. 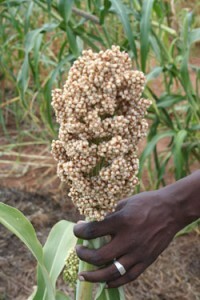 Sorghum – a hardy but nutritious cereal – is suited to arid conditions such as the southern parts of Zimbabwe. Sibanda says improved sorghum varieties such as Marcia have helped triple his average harvests of 500kg of sorghum per hectare. Marcia is one of 12 improved sorghum seed varieties developed and released by the Zimbabwe station of the International Crops Research Institute for the Semi-Arid tropics (ICRISAT) through the research collaboration between scientists, public and private sector organisations. Thanks to agricultural science research, Sibanda is one of a growing number of small-scale farmers boosting their yields using improved seed varieties and advancing food security, one of the cornerstones of the recently agreed Sustainable Development Goals. The goal of growing enough food efficiently and effectively has motivated another farmer, Eveline Kwarikunda, from the Bubaare sub County in the Kabale District in the southwest of Uganda. Kwarikunda used to cast her sorghum seed randomly and wait for harvest time. Not anymore. She now plants improved seed in lines, spaces the crop, weeds it frequently and her yields have tripled. The change in her farming methods did not happen overnight, Kwarikunda admits. It was a result of collective nudging and awareness raising when she joined the Bubaare Innovation Platform (IP). An Innovation Platform is a formal structure bringing together farmers, researchers, extension agents, policy makers, and consumers selected along the value chain of a specific commodity or system of production. Concerned about the linear way agricultural research was being conducted in Africa and the apparent limited participation of all agriculture actors as partners, the Ghana-based Forum for Agricultural Research in Africa (FARA) and the Centre for Tropical Agriculture (CIAT) developed the concept of Integrated Agricultural Research for Development (IAR4D). The concept has been promoted through innovation platforms which help members find innovative solutions to identified challenges. Investing in science, technology and innovation will help Africa meet the ambitious Sustainable Development Goals (SDGs) and improve livelihoods of its citizens. Last September, world leaders adopted the Sustainable Development Goals (SDGs), a global set of goals, targets and indicators to guide international development for the next 15 years. South Africa’s minister of Science and Technology, Naledi Pandor, told the inaugural Science Forum in Pretoria last December, that Africa cannot advance without investing in science. Pandor bemoaned that science was not a development priority and Africa needed robust national innovation systems to translate creative ideas into solutions to pressing development challenges. “Unfortunately, science is still at the margins of government attention – seen as less significant than water scarcity, food security and disease burdens. Yet, all of these can be addressed through science,” said Pandor. In 2007 African Union member countries pledged to invest one per cent of their GDP by 2020 in science and research, an ambitious bid for science-led development. Science, technology and innovation are key routes for Africa to achieve the SDGs, says Lucille Spini, Head of Science Programmes at the International Council for Science (ICSU), explaining that it is crucial to consider the social sciences as many SDGs refer to social transformations. “We need to foster attention to social sciences for example, in capacity building programmes, in order to enable an integrated approach in addressing SDGs,” Spini, told IPS adding that the ICSU was collaborating with the International Social Science Council (ISSC) in promoting the integrated approach. According to the World Bank, Africa needs to close its current skills gap and enrol more students in the Science, Technology, Engineering and Maths (STEM) subjects to foster science-led development. The World Bank in their report emphasized that Africa needs to produce scientists who match the skills needed by industry. Besides, Africa’s research competitiveness is being curtained by brain drain, lack of supportive infrastructure, poor science policies and the mismatch between science research and industry needs. Zimbabwean researcher and land policy analyst, Prof. Mandi Rukuni, says Africa needs focused investment in science research to tackle challenges of productivity, marketing and technology adoption faced by small-scale farmers who keep Africa fed. “Science should provide real solutions for farmers, youth and women enterprises but there is focus on lab and field research and not on the people who need the solutions of science most,” Rukuni, a Professor of Agricultural Economics, told IPS. Citing the example of the changes in agriculture systems in Zimbabwe, Prof Rukuni has researched extensively on the country’s land issues, and said most technologies being promoted for small-scale farmers were not suitable for them but for large scale farming which emphasised use of tractors and massive inputs such as high levels of fertilizers. Science, technology and innovation have been identified as key to Africa’s development under the Africa Agenda 2063 – a development roadmap for the next fifty years adopted by African Heads of State. The Agenda calls for action to ‘catalyse education and skills revolution and actively promote science, technology, research and innovation, to build knowledge, human capital, capabilities and skills to drive innovations and for the African century’. Africa is rich in mineral and natural resources, making it an attractive investment destination, however, it faces a range of challenges in delivering better education, health, energy, water and shelter to its growing population of more than 1.2 billion people. 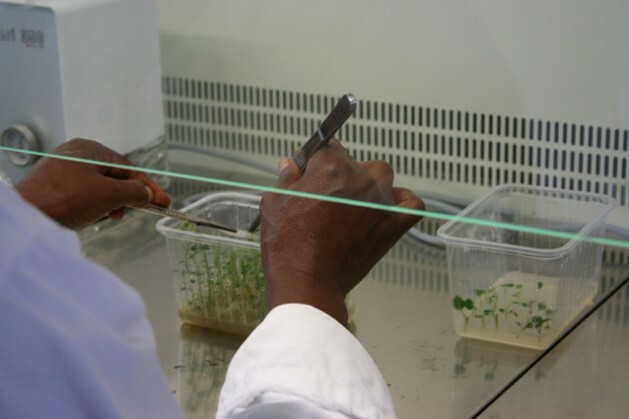 Promoting science research in Africa has also been stymied by a growing deficit of skilled workers in the applied sciences, engineering and technology (ASET) fields.